On this episode of the Gunmetal Armory, we discuss Ammunition Storage, Ammunition types, and Ammunition Stockpiling. We are also going to do the usual Product Pick Of The Week, cover any “Ask Dane” questions, and do a Give-Away. We’re going to be giving away an LAPG Ultimate Survival Pod from LA Police Gear. We will be doing a trivia question just like we usually do. You will have to call in to the studio to answer the question, so be sure you’re ready to do it. I am going to do an “Email-Entry Give Away” for a bottle of Sawyer Premium Insect Repellent very soon too. I will give the listeners a “what you do if” scenario, and you will email me an answer over the week following the question. Whoever has the best answer will win the giveaway. Listen to this broadcast or download “Ammo Storage & Stockpiling” in player below! 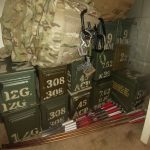 It is difficult to put into words just how important it is to stockpile ammo. Its not just important for self defense purposes, its also important for hunting, for the components, and for barter. We will go into these reasons, and the purpose behind them. 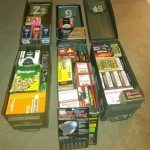 There are also specific ways to store your ammo, ways to make your stockpile last longer, and specific types of ammo that fair better over long term storage. We will cover all this and more this Thursday at 6 PM as we travel through the Gunmetal Armory. Previous: Previous post: KING OF THE WORLD!